Well, another busy week has come to a close and the weekly review is full of awesome stuff just for you. This week I covered how to get the most from a guitar making forum, how to pick the perfect beginner woodworking project, and a tutorial on how to make a wood and metal ring. Enjoy. 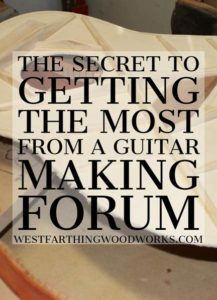 In this post, I reveal The Secret to Getting the Most From a Guitar Making Forum. It’s a really simple trick, and you can some away with years and years of hard fought knowledge about making guitars in a very short time. Forums are still a thing, and they are loaded with people that love to share information about their craft. In this case, guitar makers from all over the world converge on one place, and post their victories and accomplishments. They also sometimes post their defeats, which you can learn quite a bit from as well. Though my trick is not complicated, it involves more than learning from mistakes. Check out the post, and remember that you can apply this same trick to any other forum on any other subject that you are interested in learning about. 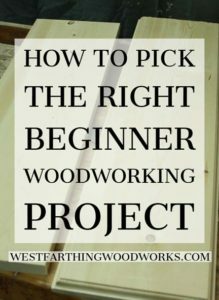 In How to Pick the Right Beginner Woodworking Project, I show you exactly what you need to consider when picking out your first several projects. The ideas are easy to follow, and they will help you make better choices. In the beginning, the decisions you make are important. They lay the foundation for your perception about woodworking. They also have an effect on how you decide to move forward, and how well that process goes. There are ways to ensure that your first decisions are good decisions, and that they propel you forward to a lifelong love of woodworking. The sad part is that if you mess up these first few decisions, you might not really get to see what woodworking is all about. You may even give up far too soon because of something that can happen during your first few projects. Don’t let that happen to you. Read the post and make good choices. The tutorial for this week is How to Make a Wooden Ring With a Metal Band. This is a chunky, oversize ring, with a gorgeous piece of laminated wood on the outside. As always, the tutorial offers full instructions, and step by step guides for making the project in your shop at home. This is a really fun woodworking project. 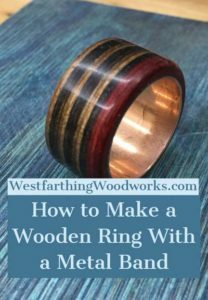 Wooden rings are simple enough to make even as a beginner, and yet you can find challenges for years and years if you pursue them. Adding metal to your wooden ring is the perfect union of strength and beauty. You get to count on the reliability of metal, and enjoy the beauty of wood. Once you start making rings with metal bands, you may never go back. If you have any questions about the Westfarthing Woodworks Post Review for 12/16/2018, please leave a comment and I will be glad to answer them. Happy building. Thanks Brian for ALL the guitar making tips you have posted, but particularly thanks for the “Fretboard slotting jig”, I made one the same as your post / video and it work really great. Best wishes to all, in advance, for Christmas and New Year. Cheers. I’m honored that you read my blog and even more so that you made one of my jigs and you like it. Thank you very much for the kind words, and I hope the jig serves you for a very long time. It’s way less expensive than buying a store bought jig, and it does the same thing, though I am sure you already know both of those things. If you ever need any help or have a question, feel free to email me. Happy building.